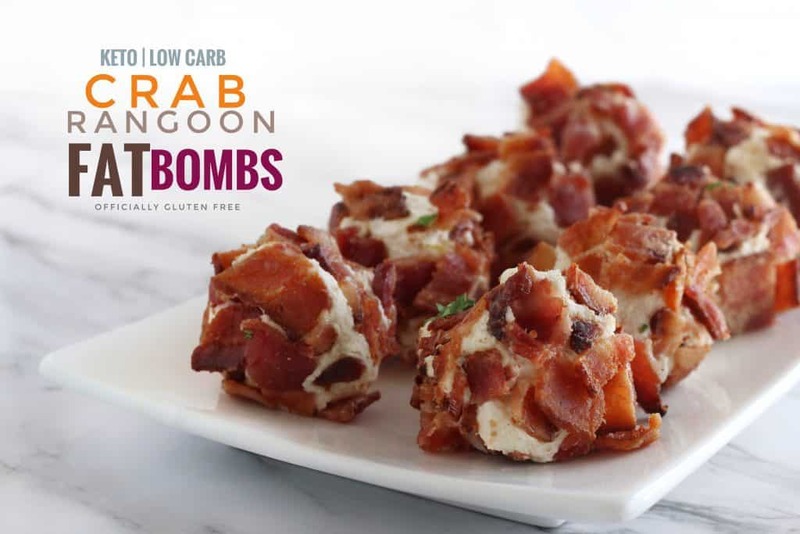 These Low Carb Bacon Crab Rangoon Fat Bombs are a small snack that’s High in Fat and Low in Carbs. 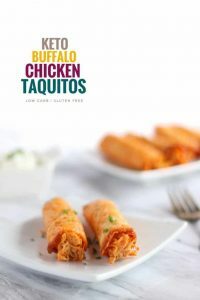 You can have them as a Quick Breakfast, or Mid-Afternoon Snack, as a Pre- or After- Workout Snack or a Delicious Keto Appetizer or Side Dish. 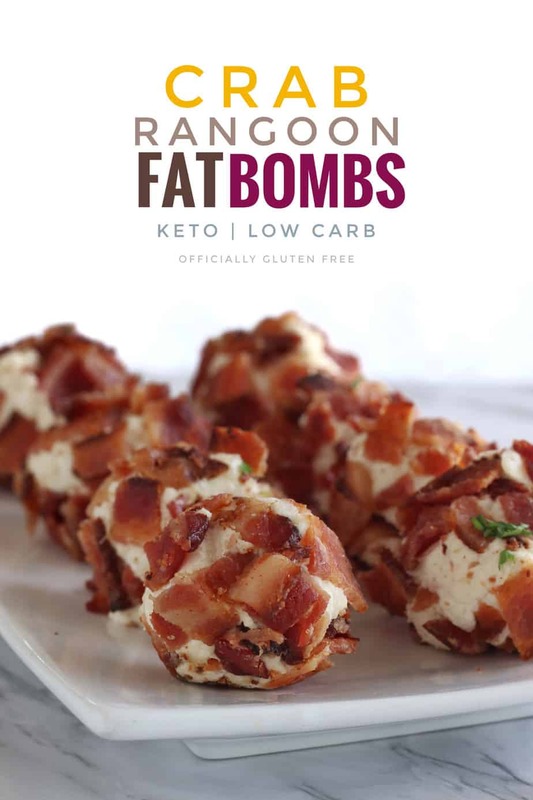 I love how easy these Delicious Low Carb Bacon Crab Rangoon Fat Bombs are to Make. Just Soften the Cream Cheese. Then in a large bowl mix it with the strained canned crab, the shredded mozzarella cheese and the seasoning. Mix it Well and place it in the fridge until firm. Then roll them in the Deliciously Crispy Bacon. 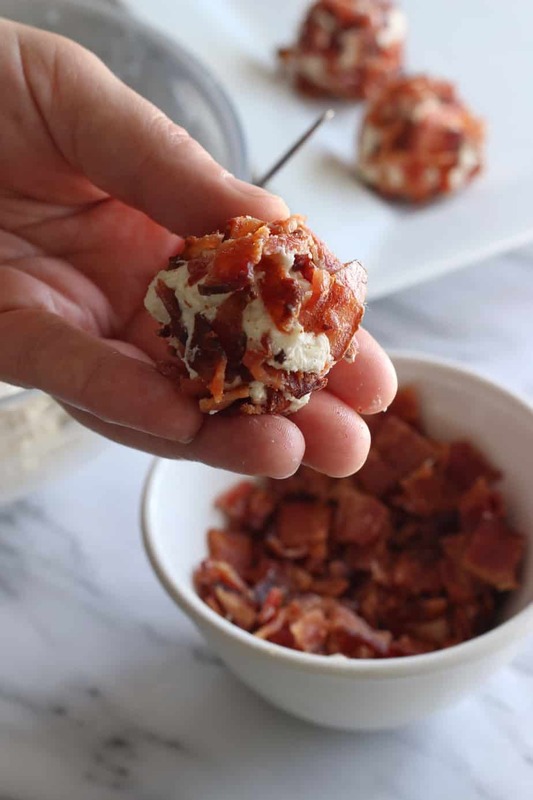 These bite-sized Bacon Crab Rangoon Fat Bombs are loaded with flavor and provide a nutritious hit of healthy fats. They’re Gluten Free and Keto. If you haven’t heard of The ketogenic diet (often called keto), it’s a very low-carb, high-fat diet that shares similarities to paleo, Whole30, and Atkins. It involves drastically reducing carbohydrate intake, and replacing it with fat. When your body switches to burning fat for its primary fuel source, that’s when you hit ketosis. 1. Soften the Cream Cheese. 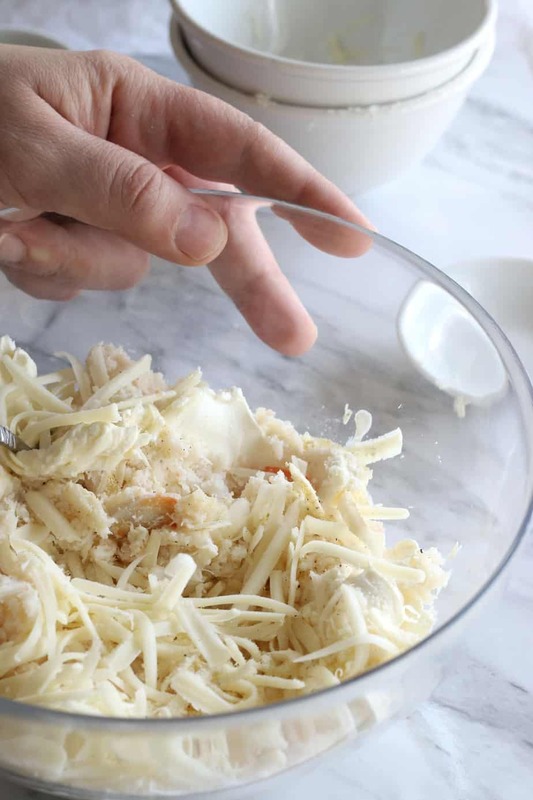 Then in a large bowl mix it with the strained canned crab, the shredded mozzarella cheese, the minced garlic, the garlic and onion powder and the salt and pepper. Mix until well Combined. Place in the fridge for 1/2 hour. 2. Cook the bacon until crispy. Set aside to cool, then chop into small pieces. 4. 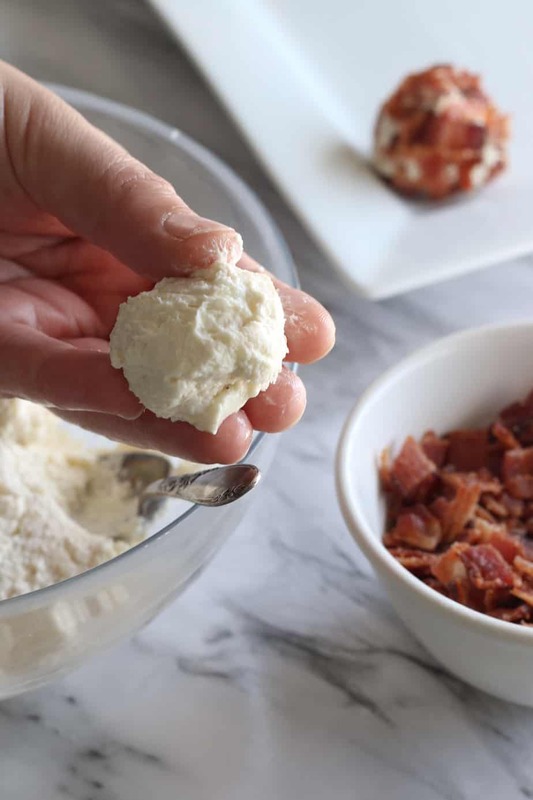 Scoop 1 Tbsp size balls of the cream cheese and crab mixture and use you fingers to make them ball shaped. 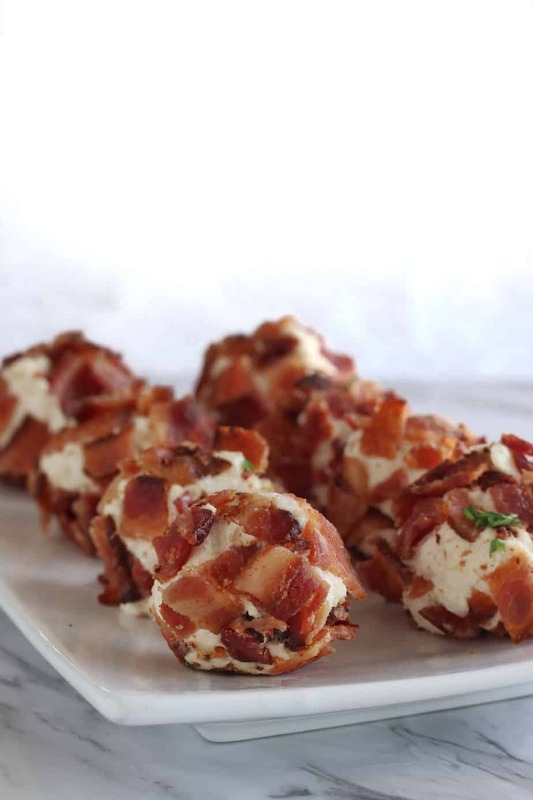 Roll the balls in the chopped up bacon. (I washed my hands between each ball.) Store in the fridge until ready to serve. 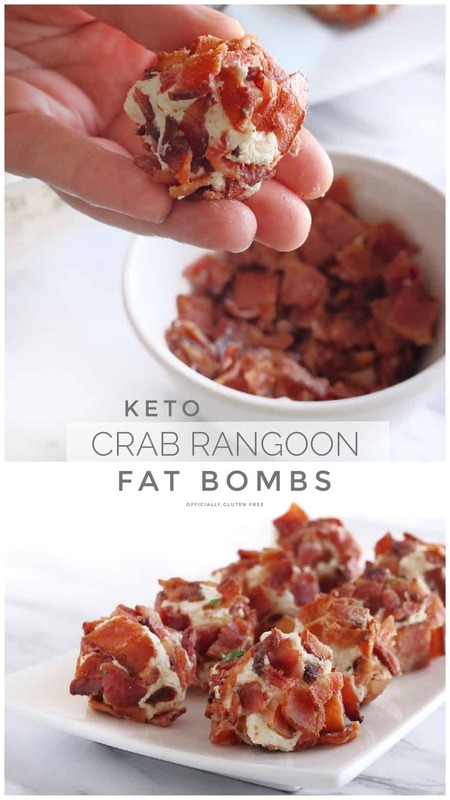 Makes 24 Bacon Crab Rangoon Fat Bombs. Soften the Cream Cheese. Then in a large bowl mix it with the strained canned crab, the shredded mozzarella cheese, the garlic and onion powder and the salt and pepper. Mix until well Combined. Place the bowl in the fridge for ½ hour. 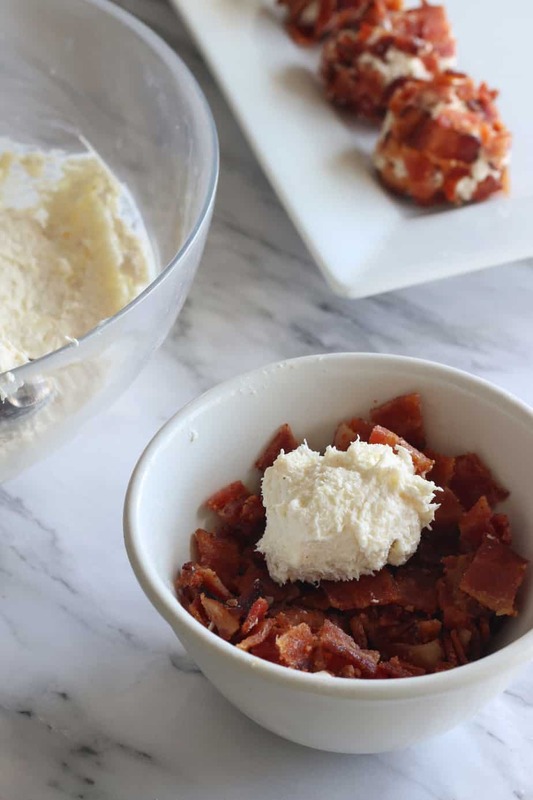 Cook the Bacon until Crispy, then set aside to cool. Then chop into small pieces. 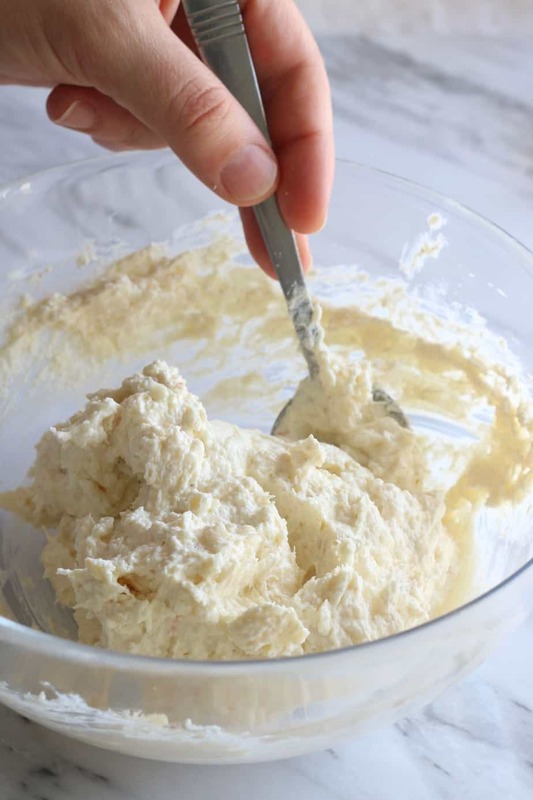 Scoop 1 Tbsp size balls of the cream cheese and crab mixture, then use you fingers to make them ball shaped. 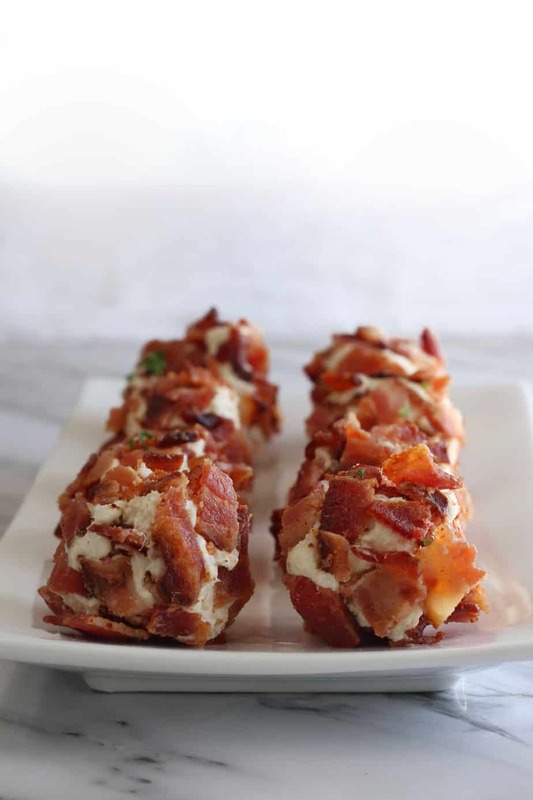 Roll the balls in the chopped up bacon. (I washed my hands between each ball.) Store in the fridge until ready to serve. Do you have the nutritional information for each of the fat bombs? I don’t have the nutritional information as of yet but I plan to include it in the future. 25.9 carbs? Is that possible for one of these? carbs are .4 The 25.9 is for the Potassium. I read it the same way as you at first. This looks like 25 carbs the way it is written but the carb count comes after the word carb so it has 4 carbs. There is no way it has 25 grand of carbs…maybe for the whole recipe but per serving. Hi Cheryl. They should last 3 – 5 days in the fridge. Can you use imitation crab instead of canned crab? Hi Abby, Imitation Crab isn’t gluten free or keto usually. It would work but most of the brands I’ve seen have wheat flour in the ingredients. Hi Jen, you could definitely make them without the crab. Is there another option to roll them in besides bacon.. sadly I don’t eat bacon ? Hi Morgan, we had some of them without bacon and they were still really yummy. It helped to keep them in the fridge for a little bit longer, to make them a bit more firm. We also tried them rolled a little toasted almond which was also very good. Can I use sour cream or ricotta cheese instead of cream cheese? Not a cream cheese person. Hi Rikkilin, I haven’t tried using either but I would say that ricotta cheese would probably work. The sour cream might not be thick enough. The instructions aren’t clear on what to do with the Finely Minced Garlic. Is that part of step 1? The sentence structure reads like it’s only pertaining to the garlic powder and onion powder. Yes, it is part of step 1. 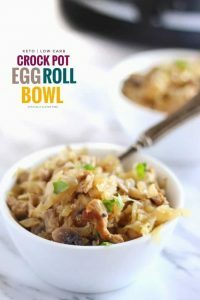 This sound so delicious will definitely be making this! Thanks for sharing. Has anyone tried a cheese other than mozzarella? These are so good!!! I could honestly each it as dinner. And with the low carb content and the way it fills you up 4 would be enough. This looks so good ! 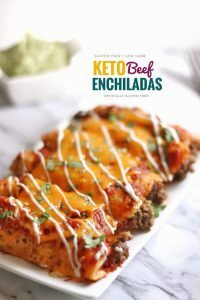 A yummy keto treat or appetizer for guests! 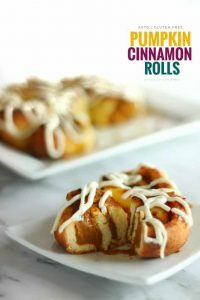 Just made these and they are soon good! Has anyone tried them warm? I feel like they would be so much better. We tried to put them in the skillet but they just melted. Though about coating them with some almond flour any trying again. Anyway to make a warm version of these? I have always loved crab Rangoon served freshly cooked and warm.